The wind instruments produced by the class can be categorized by the source of the vibration: air jet (fipple flutes, cross-blown flutes, and panpipes), double reed, or lips. Spencer’s I can’t believe I’m turning this in (left) is a PVC pipe with fingerholes. The fipple is cut into the pipe and augmented with duct tape. A wooden dowel stops the mouthpiece. Austin’s Pipe that’s Vexingly Cool (right) is made in a similar fashion and plays a C scale. 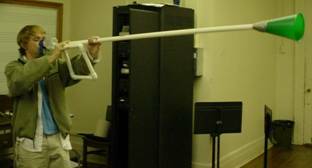 Ben (left) made the Keepin’ It Real Flute out of PVC pipe and stopped the end with tape. It’s fundamental note is a B. The positions of the fingerholes are arbitrary. 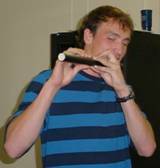 Eli’s Keepin’ It Real Flute—Black (right) is similar but is wrapped in black tape. It is therefore called the It plays five pitches starting at D-flat. Next in the series of PVC flutes is Chip’s Poseidon’s Palette of Notes, so named because it appeared to be producing infrasound like whales do. 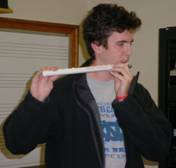 A pentatonic scale can be played on it: A-flat, B-flat, C, E-flat, F. Alan’s Lake Gaston Flute is made from driftwood. The diameter of the pipe makes it hard to direct the air jet across the hole. 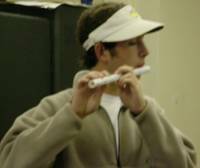 The Earwax Flute that Tom made uses PVC pipe plugged with wax. It plays a C scale. Jarrett (left) and Kimberly (right) made their panpipes out of bamboo. Jarrett’s is called the Bamboozle; Kimberly’s is Frank’s Syrinx and it plays an F scale (a little sharp). 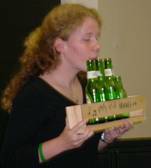 McKenzie (left) and Sara (right) made bottle panpipes. McKenzie’s Joey Stewart’s Busting a Cap is mounted on a lazy susan and plays G, B, D, B. Sara’s Happy Hour Harmonica is in the key of A. Both could be tuned by changing the amount of water in the bottles. Matthew’s Happy Hour Oboe (left) and Robbie’s Postroboe (not pictured) both use plastic straws for double reeds. They play in B-flat and E-flat respectively. Christian’s Tube-a uses a bassoon reed and has a sliding section. It is definitely a bass instrument, in the key of B.
Luke made the Keepin’ It Real Trombone from PVC pipe and a megaphone (the plastic bottles are for decoration). It can be played with or without a mouthpiece, and it plays D-flat, F, A-flat. It does not actually have a sliding section like a trombone. James L. plays the Posterphone that has fingerholes like a cornetto (though they don’t do much) and has a soda bottle mouthpiece. It plays C and F#. Alex’s Wailing Tube (made from a mailing tube) is modeled on the Australian didjeridu. It has a fundamental that is almost but not quite F#.